MOVE IN TODAY! 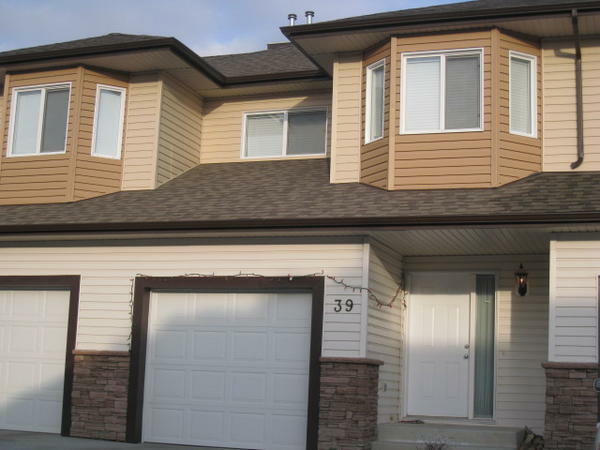 !This bright, clean townhouse in the quiet community of Brintnell in NE Edmonton is clean and ready for you! All you need to do is move in!One look will have you hooked! This townhouse condominium complex of Brintnell Landing offers you everything you are looking for! Safe, family oriented, and close to everything!Inside your new home, you will be greeted by your open concept kitchen and living room with corner fireplace. Your kitchen is fully stocked with black appliances including fridge/freezer, oven/stove and built in dishwasher. Lots of cupboard and counter space as well! You will love the patio off your kitchen - the perfect spot for those summertime BBQ !! Large half bathroom on the main floor as well. Up the wide staircase, you will find your 3 spacious bedrooms. Each bedroom has large closet space, with a walk-in closet in the master bedroom. One LARGE full bathroom upstairs as well, with an adjoining door to the master bedroom. Lots of natural light flows in to your new home! !Downstairs, you will find an unfinished basement - perfect for storage or an extra play room! Safe walk-out patio doors lead to a small grassed area and visitor parking.Single Car Attached garage.Satellite Ready - just call and hook up the services!Washer/Dryer included in rent.Utilities separateZERO yard maintenance.No Smoking.Call 780-701-7400 to book your appointment TODAY!